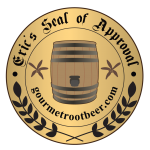 Premium gourmet root beer is now officially a thing. There’d been a few before, notably Virgil’s Special Edition Bavarian Nutmeg Root Beer and Thunderbeast Black Label (blog posts coming soon). Miss Lady kind of qualifies as well. But this one finally makes it official in the way that butterscotch is no longer a unique variant of root beer. 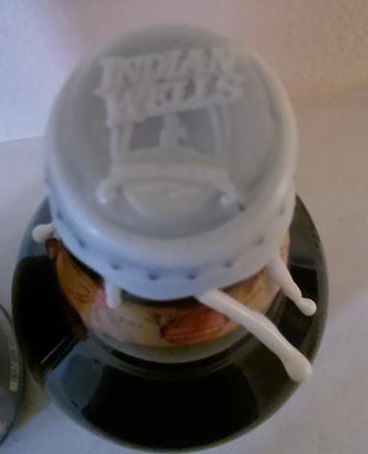 The Indian Wells Brewing Company also makes Death Valley Root Beer which, well, I’m not a fan of, to put it lightly. Despite that, when I contacted them about a mail order, they even offered to send a free sample. Now that’s some guts. The 22 ounce bottle is absolutely beautiful and wax sealed. The brew itself is aged in Iberian chestnut barrels and made with real birch, sarsaparilla, ginger, and other nice ingredients including pure cane sugar for those who care about that. The Body is full and complex with a rich and creamy texture and an aged flavor. There’s a dark rooty core accented by a little licorice. There are notes of birch and wintergreen and some vanilla. There’s also a hint of bitterness but this gives way to more pleasant flavors. The Bite is solid and spicy at just the right amount. The Head is excellent. It’s very tall and foamy to the bottom of the mug. The Aftertaste is rich vanilla with caramel hints. Wow. I wasn’t expecting that level of complexity and spiciness. It’s quite a bit different from the standard vanilla and honey brews I constantly rave about, but I love it all the same. This is one you can quaff, but is far better to drink slowly to savor all that is going on. I’m proud to give this one my Seal of Approval. Finally, a premium gourmet root beer that’s worth getting for more than just the awesome bottle. See how it rates against other root beers.